Made to order. Please allow 3 to 4 weeks for delivery. 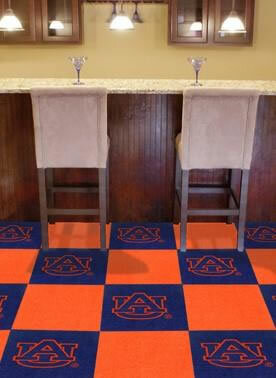 Sold by the case: 20 tiles, 5 Sq Yds, 45 Sq Ft, 18" x 18"
FANMATS Collegiate Carpet Tiles are Officially licensed by the NCAA. No underlay or pad required. Tiles have pad/underlay attached. Each box comes with 10 logo tiles and 10 matched solid color tiles. Officially licensed. Made in the USA.